Cold! How is this Spring I mused as with teeth chattering amidst a crew yawning competition we took the long low water route to Gilkicker. Things perked up a bit once we were in the starting area and contrary to forecasts were greeted by a just left of south breeze of around 8 knots. With a fast east going tide the SOOD, Sunshine set a course of a fast kite reach to Stokes Bay Central, a beat across the tide to Kemps Quay and a kite run home. With 11 yachts in the starting area, the normal 2 starts were called and in the slower handicap group Spirit of Kudu got away best with her spinnaker up and set just before the gun. In start 2 Sunshine had the edge over Jolly Jack Tar down to leeward but with a wicked looking code zero doing the business. Then Whack! 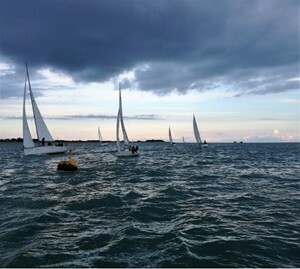 The fleet was hit by a shift to the west and crews scrabbled frantically to douse kites as the leg turned into a beat. The front runners still came off best however and as SBC loomed the wind broadened and eventually settled back just left of south. The beat to Kemps Quay had plenty of shifts in it but there was no catching the front runners who also led the way down the run home. Jolly Jack Tar was too quick for the rest of the fleet leading across the finish line and taking the chocolates in both the IRC and NHC fleets. The smell of a warming curry was a delightful greeting for the crews as they took full advantage of the hospitality of HSSC, but more spring like weather next week please.